Mediterranean Diet for All » Mediterranean Diet • Mediterranean Diet foods » Summer Fruits of the Mediterranean and Mediterranean Diet! We’re already in the middle of summer and the fruits of the Mediterranean are already ripe. There are many summer fruits in the Mediterranean diet. Their common trait is the intense presence of sugar and water, as well as their amazing taste, which makes them a true temptation. People who want to keep a healthy diet, with the principles of the Mediterranean diet, should consume them daily. 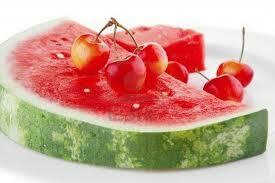 In this article we will review two of the most popular Mediterranean summer fruits: Watermelon and Cherry. In the heart of summer and the takeoff of mercury, watermelon is an oasis of freshness with its rich taste and strong aroma. Either on its own or along with some feta cheese, it is a satisfying snack or a light dinner, with a beautiful color combination. Watermelon is one of the kids’ favorite fruits, due to its sweet and refreshing taste, its high concentration in water, as well as its plethora of vitamins. It is rich in vitamin A, C and B6, thiamine, lycopene and potassium. It should be eaten when it is ripe, otherwise these micronutrients are in lower levels. Watermelon is an excellent source of antioxidants, as it contains vitamin C, beta carotene, as well as bioten, thus contributing in the protection of our body against several types of cancer. Also, it contains vitamin A, which is important for better vision and helps fight infections as it strengthens the body cells. As for vitamin C, it helps the body’s defense system against infections, while protecting from oxidative stress and metabolic products that accelerate the aging process. Watermelon also contains vitamin B6, which contributes to the synthesis of neurotransmitters in the brain, leading to better mental and psychological health. Moreover it is rich in potassium, which helps regulate heart function and blood pressure, yet having a diuretic effect. Last but not least, watermelon is rich in lycopene, a substance which is believed to have antitumor activity and has been of particular concern to researchers the last years. Lycopene found in watermelon has powerful antioxidant effects and is more bio-active and available for our body compared to the lycopene found in tomato, which is the most well-known representative of lycopene. More specifically, lycopene neutralizes free radicals formed during the cellular metabolism. Its effect is really significant when it comes to cases of prostate cancer, while, at the same time, it has beneficial effects on the cardiovascular system. In conclusion, watermelon is a notable source of beneficial nutrients with important protective and beneficial effects on our health. It is also known from the ancient years to have cosmetic properties, which we still use today, making face masks with watermelon rinds. First choose a watermelon that has symmetrical round shape without dents or nicks and with an adequate weight (varieties consumed today can reach a weight of several pounds). Finally, turn it over and find a spot on the watermelon is yellow. This is the point at which the watermelon rested on the ground when matured. Regarding its preservation, it should be stored in the refrigerator, with some membrane preserver, and not cut in pieces, as it gets dehydrated and its flavor is altered. It can be consumed cut in slices or in fruit salads. You can also blend it to make a smoothie or a fruit punch. In the Mediterranean, it is often eaten with white feta cheese or Halloumi cheese and bread as a main course. Cherries give our body a variety of nutrients, vitamins and minerals, thus contributing to its proper functioning, as well as the prevention and treatment of many illnesses and degenerative diseases. They contain minerals, fiber and oleic acid. They are also rich in vitamins A, C and B, in potassium, calcium, phosphorus, iron and copper. One cherry gives 4 calories. Cherries are part of the Mediterranean Diet. Cherries are rich in phytosterols, which belong to the group and sterols are natural constituents of plants. These are substances that do not give energy and thus do not contribute to caloric intake of the body. Many studies, however, have shown that the intake of adequate amounts of phytosterols leads to a reduction in total blood cholesterol. This occurs either by reducing intestinal absorption of food ingested cholesterol or by changes in the metabolism of cholesterol in the intestinal cells. Cherries increase the body’s natural defenses against disease and have antiseptic properties against inflammations and infections. A research on the therapeutic value of cherries claims that their juice is a powerful antibacterial agent against dental caries. More specifically, it was found that cherry juice suppresses by 89% the activity of the enzymes that lead to plaque formation, i.e., the initial symptom of caries. Another important action of cherries is that they significantly reduce mental fatigue, which makes them especially useful to students in the exam periods at the end of the school year, which is when they can be found in abundance. They also have corresponding effects on physical fatigue, mainly due to ash mineral salts they contain, which increase the alkaline reserves of the body. Moreover, cherries are conducive to the good functioning of the intestine, while they have laxative action, mainly because of the fiber and organic acids they contain. Additionally, because of their content in minerals, they relieve the symptoms of rheumatoid arthritis and gout. Finally, cherries are particularly rich in a certain type of plant chemicals called anthocyanins, which give them their characteristic red color. These chemicals are known to neutralize carcinogens. Also, in other studies (University of Michigan) anthocyanins were found to increase by 50% the production of insulin from pancreatic cells. Therefore, eating cherries may also help cancer and diabetes prevention. More specifically, anthocyanins, due to the increased insulin secretion, could impart a better glycemic control by preventing the hyper- or hypoglycemia and -consequently- diabetes. Cherries have round shape and their skin is smooth and glossy. They are small in size and their color is different depending on the variety. Look for cherries that are not scratched, deformed, moldy or shriveled. Buy only the amount of cherries you want to eat in the next few days. To keep them fresh, put them in the refrigerator. The moisture of the refrigerator helps them stay fresh for a longer period of time. Before you consume them, you should wash them with a lot of warm water. Cherries are mainly consumed as raw, fresh fruit. There can also be found canned and are used in pastry, usually in tarts or cakes. They are also used as jams or preserves, which are made of all varieties. Their pits are used to give flavor to ‘brandy’. Finally, bitter black cherries are used to make Kirsch, Cherry Brandy, and other alcoholic beverages. Watermelons or cherries, peaches, apricots or melons, the summer fruits of the Mediterranean are in their best season and are full of beneficial traits. So, make your pick, and enjoy sweet and fresh Mediterranean flavors all summer by simply following the Mediterranean diet!